Tinder has a reputation as a hook-up app, but what about people who want to find lasting relationships? Should they look elsewhere, asking friends to set them up or striking up conversation at a bar instead of going online? How does Tinder really compare to people who meet the old-fashioned way – in real life? A new study (commissioned and released by Tinder) shows that contrary to stereotypes, many people use Tinder with the intent of finding a relationship. And for those who prefer the real life approach, who proclaim it to be more genuine or organic, it seems this is not the reality, either. Thanks to Tinder, we may now have a glimpse of what daters really want. The study compared the preferences of its users with those of offline daters (those who are not currently online dating and those who have never tried), and found that Tinder users were more likely to be looking for relationships, not hookups. According to the report, only 9% of men on Tinder say that maintaining a committed relationship is difficult, compared to a whopping 30% of offline daters. Also, only 9% of Tinder users say it is difficult to commit because there are so many options, versus 42% of offline daters who say the same. As it turns out, Tinder users aren’t averse to expressing their feelings when it comes to romance either. In fact, they are slightly more likely than offline daters to fall in love and want to proclaim it. The survey found that 35% of online daters say "I love you" within the first three months of being in a relationship, compared to 30% of offline daters. The study found a particularly interesting statistic that seems to go against a lot of online dating assumptions. In the age of unsolicited messages and photos, a frequent complaint of women is that too many men are sending unwanted sexts, and it’s a huge turnoff. Shockingly, Tinder found this assumption about men to be false, with men and women both admitting to sending unsolicited sexts in equal amounts – 50% of the time for each. And when it comes to politics, there is a slight difference between online and offline daters. Online daters are less willing to compromise; 71% consider opposing political views a deal breaker, compared to offline daters at 66%. 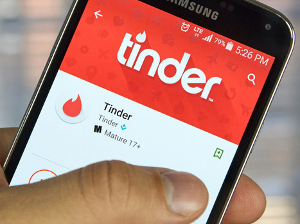 Morar Consulting administered a survey via the app to 7,072 Tinder users, ages 18 to 36, and a second survey of 2,502 offline daters, ages 18 to 35. For more on this service you can read our Tinder app review.